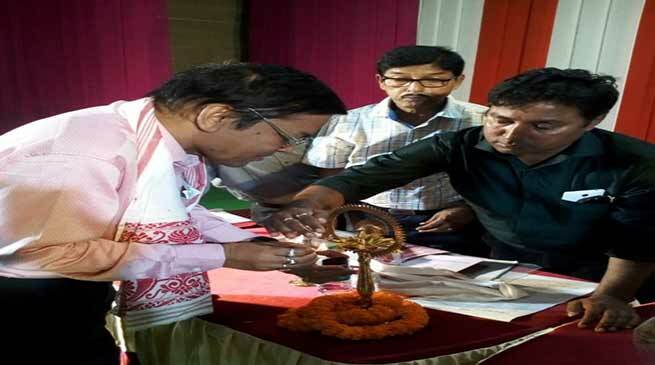 A district level awareness camp on Civil Rights Act 1955 and Scheduled Castes and Scheduled Tribes (Prevention of Atrocities) Act 1989 was held at Rabindra Bhavan auditorium in Hailakandi town of Assam on Sunday. Inaugurating the one-day awareness camp, Additional Deputy Commissioner, Amalendu Roy said various provisions of the SC and ST (Prevention of Atrocities) Act 1989 provide safeguard to the SC and ST communities and upholding of their rights against all sorts of deprivation and discrimination. He appealed to the communities to be aware of their rights so that they can assert themselves in society and forge ahead both socially and economically. Roy urged the organisers to hold such awareness camps in an organised way, especially in SC and ST concentration areas of the district to ensure effective implementation of the Act. Speaking on the occasion, Professor Yagneswar Deb of SS College, Hailakandi, exhorted the SC and ST communities to be fully aware of their rights guaranteed by the Constitution and different legislations to assert themselves poltically, socially and economically in society. Stressing on the importance of education, Deb said it can play a pivotal role in helping these communities to assert their rights and to forge ahead on various fronts along with advanced communities. He said inclusive development is possible only when these communities catch up with advanced communities. “We have to take along the SC and ST communities to ensure inclusive development,” he said. Deb suggested the organisers to hold such camps at school and colleges and in SC and ST concentrated pockets to make it more effective and meaningful. President, All Assam Tribal Sangha, Hailakandi District Committee, Jamu Pow Kabui, said the police and civil administrations must ensure effective implementation of different provisions of the Act to do away with social and economic discrimination and prevent atrocities against SC and ST communities. He urged the communities to use the provisions of the Act as a weapon to assert their rights effectively. In his brief address, Chairman, Subdivisional SC Development Board, Hailakandi, Manoj Roy appealed to the communities to know the provisions of the Act to assert their rights. Chairperson, Integrated Rural Artisans’ Development Organisation – the organisers of the awareness camp – Banajit Talukdar said the provisions of the Act not only deliver justice through affirmative action but also monetary relief from certain offences committed against the SC and ST tribes. Talukdar said he would propose to the Director, Welfare of Plain Tribes and Backward Classes to hold such camps in SC and ST concentrated areas in near future. The inaugural function, was attended, among others, by Research Assistant, Subdivisional Welfare Office, Hailakandi, Ranabijoy Bhattacharjee, Research Assistant, Welfare of SC, Assam, Hari Kumar Das, social activist, Sarifuddin Choudhury and DIPRO, Sabir Nishat. It may be mentioned here that Director, Welfare of SC, has selected Hailakandi and Hojai districts for such awareness camps in Assam. Karimganj Lok Sabha constituency under which three LACs of Hailakandi district falls is a reserved SC constituency.